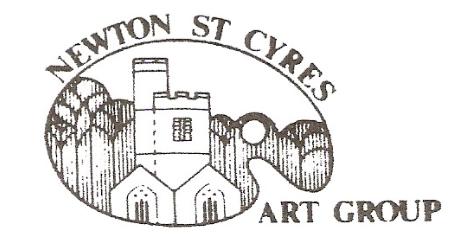 Newton St Cyres Art Group extends a warm welcome to new members. We are a friendly group of enthusiasts who meet monthly to enjoy a talk/demonstration from a visiting artist and occasionally to paint together and chat. Workshops led by visiting artists and exhibitions are an optional extra with no obligation to participate. Why not come along and see if you would like to join us. Wednesday 27th January 2016 @ 7.30pm. Michael Chappell 'Creating a dynamic seascape using acrylic'. Friday, 27th. February--Club Morning -- 10am. -- 12.30pm. " Still Life with fruit" , bring your own material and fruit and make tour painting traditional or modern. Wednesday, 30th.March -- A watercolour demonstration by local Dartmoor artist John Christian. Wednesday, 27th. April --A. G. M.
Wednesday 26th. May -- Critique of members work by Jane Baker. Wednesday, 29th. June --A pastel demonstration by wildlife artist Heather Irvine. Wednesday, 27h. July.--A watercolour demonstration by Mike McDonald, painting in the manner of F, J. Widgery using modern materials. All meetings are in the Village hall at Newton St Cyres.